The Model 81 Tesla Coil system was designed from the ground up to be a high-performance large Musical Tesla Coil harnessing modern transistor technology, and builds upon the many things I have learned in several years of building Tesla Coils. The Model 81 Tesla Coil derives its name being designed around an 8"-nominal diameter secondary coil, and being the first of its kind that I have designed. I also later developed another 8" design but more compact in size. More information for that coil system can be found in my Model 82 page. The Model 81 is probably the most powerful musical DRSSTC in the South-East Asian region, and certainly the first of its kind in any type of local public exhibition. 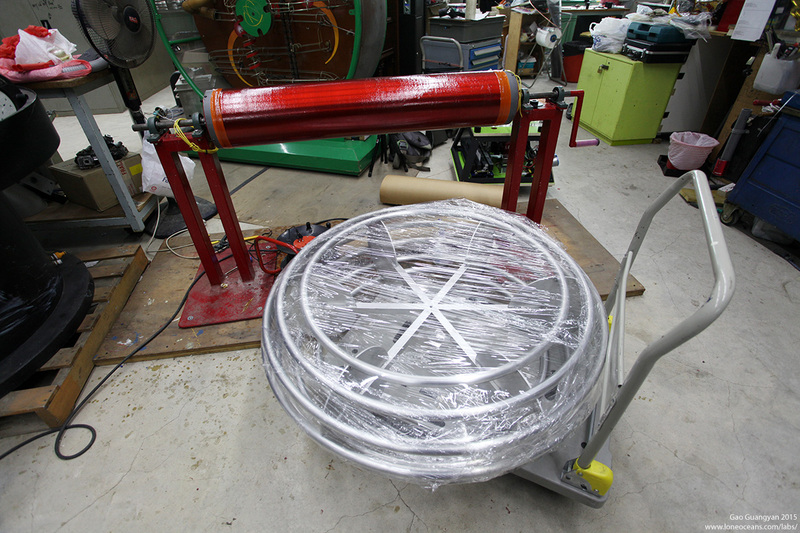 As of writing, it stands as the largest Tesla Coil I have designed and constructed. This project was completed in July 2015. 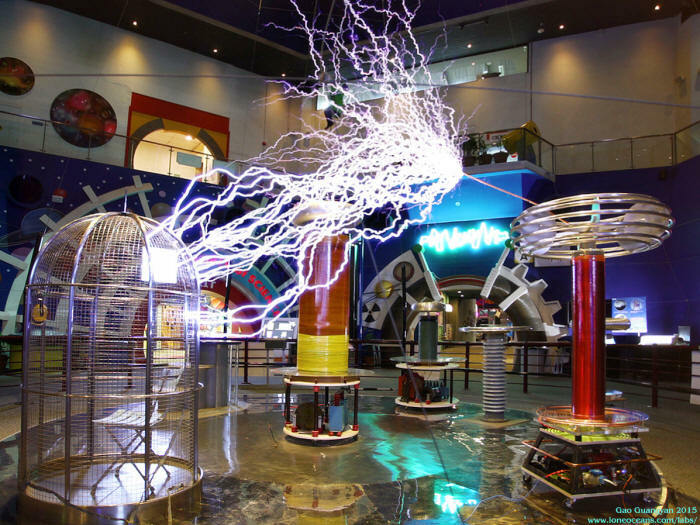 This project was done in collaboration with the Singapore Science Centre as a bid to revitalize the existing but somewhat aging spark-gap Tesla Coil exhibit in the Main Atrium (as shown above), and will be run together with the large spark gap coil during shows. The original spark-gap coil is a ~7.5kVA unit built by TTR and has proven to be a reliable performer in its ~10 years of operation. 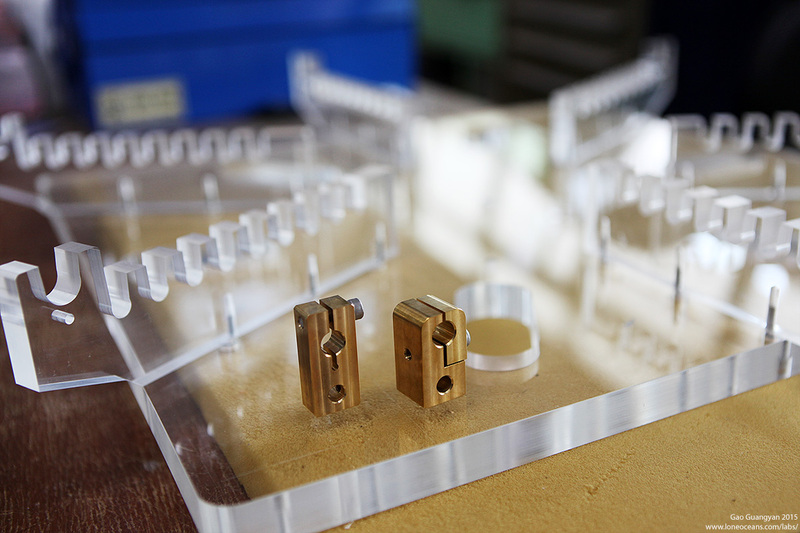 However, the stress of daily operation has started causing numerous problems, including two new secondary coils that had to be wound in-house and difficulty in getting replacement components after the closure of TTR. The coil, while still very impressive in action, has also started to show its age. This was the motivation for the Model 81 DRSSTC. For more information on DRSSTCs, please feel free to read my other project pages on DR-type coils. Unlike spark-gap coils, the Model 81 is electronic, and supports playback of music by modulating the spark output thereby creating huge electrical discharges that actually produce the music (see video below!) 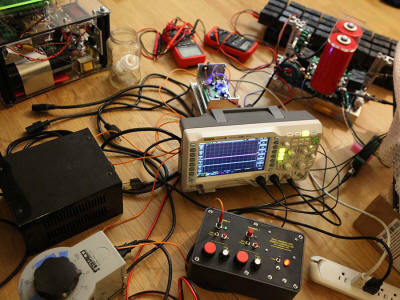 Control and communications are done via fiber optic for electrical isolation, and the coil can be controlled by a computer or music keyboard for musical interactivity. Power to the coil is provided by a single phase 60A 240V circuit, with power consumption ranging between 1kW to 10kW depending on operating mode. 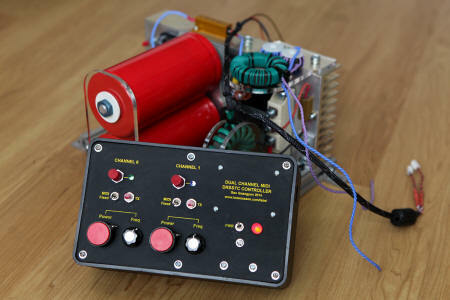 The coil is capable of electrical discharges in excess of 3m, perhaps exceeding the output discharge of the existing large spark-gap coil, and runs with a maximum instantaneous operation pulse power of over 800kW transient in the primary circuit (or even greater with ground power arcs). The coil also features intelligent transistor drive techniques to increase operational reliability and power handling, including predictive switching, under-voltage lock-out, and over-current detection. The motivation for the project stemmed from my initial DRSSTC 3 project back in 2013. 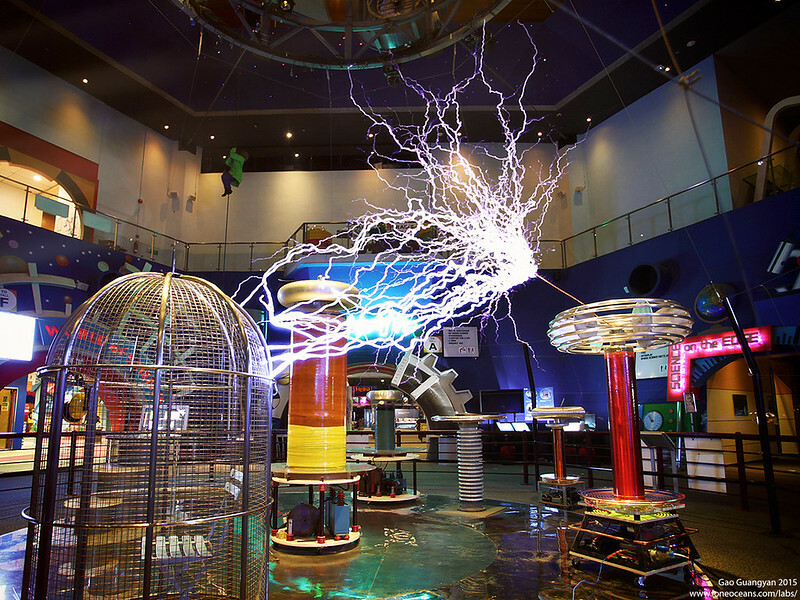 In early 2014, discussions took place kicking around the idea for a new, powerful electronic Tesla Coil system in the Singapore Science Centre's atrium. Several months later, the project finally took root and quickly developed into reality. I designed the Model 81 Tesla Coil completely in CAD to ensure that all components would fit perfectly within design constraints. This also allowed me to balance the technical implementation with the artistic direction I had imagined in my head. 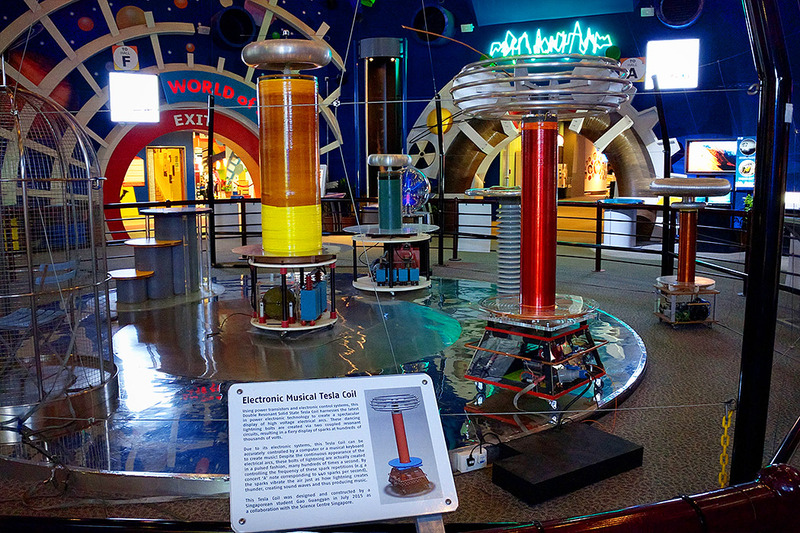 The complete Model 81 Tesla Coil stands just about 2m tall. The coil was designed specifically to fit within the shielded platform in the atrium of the Science Centre, and has a more 'modern' design to contrast with the existing exhibit. Above shows the power inverter design, as well as a rending of the entire coil. I decided to go with a trapezoidal base box to add a distinctive character to the coil. 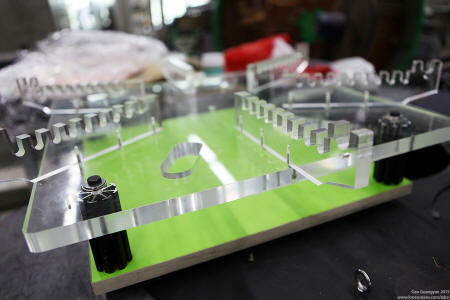 This makes the base more challenging to construct but I believe is worth the added effort! 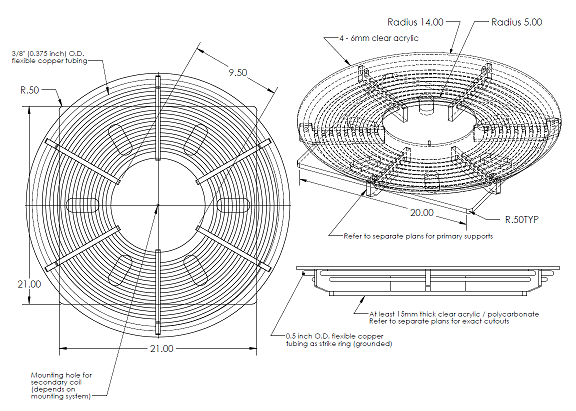 Designing the entire coil in CAD was extremely helping in the fabrication that followed since I knew exactly how everything would come together, and was confident that it would fit together perfectly. This also aided in collaborative efforts with the Science Centre. Main construction of the Model 81 Tesla Coil took place over 3 extremely busy days in July 2015, though work on the power electronics was done earlier on. 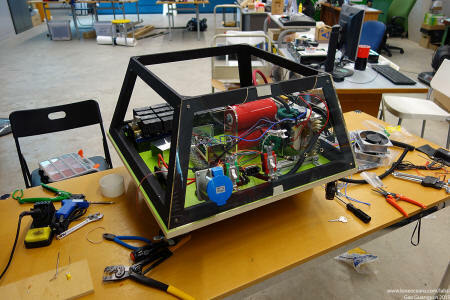 The heart of the Model 81 Tesla Coil (or any DRSSTC for that matter) is the power inverter, which needs to be designed to handle the instantaneous power required during operation. 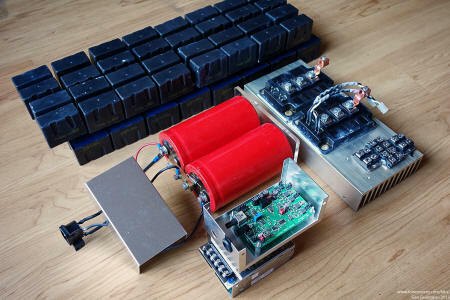 The inverter was designed around a full bridge of 300A 1200V IGBTs. With intelligent switching techniques with the logic driver and resonant operation at zero-voltage-switching, I can push the bridge reliably up to 1500A peak, and likely more, though the coil is expected to run at 1.2kApk nominally. Instantaneous power is supplied from two inverter-grade high capacity bus capacitors. This was mounted directed to the IGBTs via a custom hand-made fiberglass / aluminium laminated bus bar for minimal bus inductance. The entire setup is mounted on a large heatsink. Gates are driven via a single large GDT. The result is a modular and compact power inverter. The inverter drives the primary circuit, comprised of a tuned primary coil and a resonant capacitor. The capacitor needs to handle the high voltage from resonant voltage rise, and must be capable of handling the large RMS power. The main resonator comprises of a 8.6" O.D. pipe wound with 43.1" length of AWG 26 double coated red-enamel magnet wire. The coil was then coated with about 5 layers of an alkyd resin-based class 180C varnish designed specifically for conventional dip / trickle stator/transformer coating. For the toroid, 7 rings of 1" aluminium pipe were shaped into rings, and the entire assembly welded together with aluminium disks and square tubing to form a 42 x 11" toroid. The result is a beautiful topload assembly with the required geometry but still being light and easy to transport. Coupled together with the secondary coil, this results in a base operating f_res of around 41kHz. 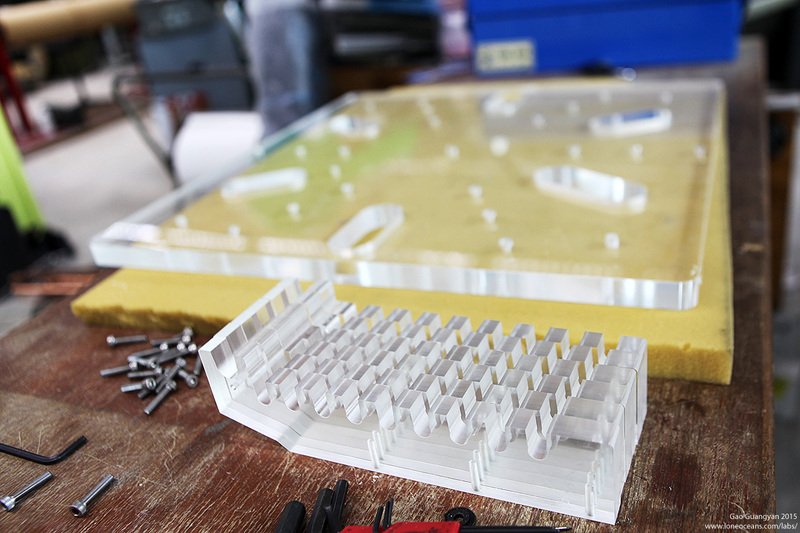 For the base-box, I enlisted the help of the in-house wood-working shop to fabricate the base. Due to some miscommunication, we had a bit of a mistake with the color scheme (should have been all back! 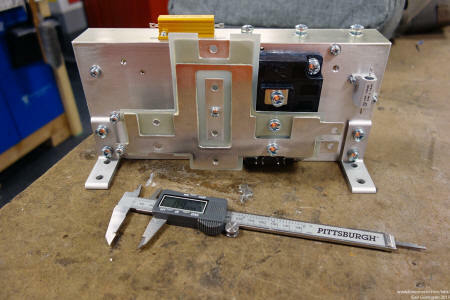 ), but the dimensions were perfect and all the components and drive electronics were easily mounted. Note the main power switches, a large 40A HRC fuse, as well as an IEC power input socket for power to the coil. 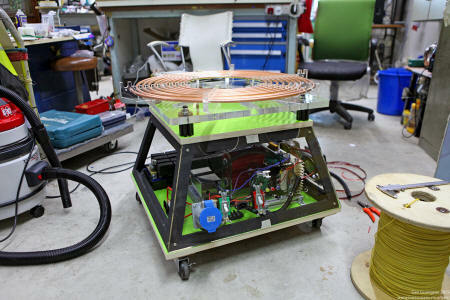 Also mounted on the box are two powerful 240V fans to cool the power electronics. Later on, the box was re-painted to to be red and black, and some small upgrades were done including a proper grounding strap added. Control of the coil is done via a custom control panel using my dual channel MIDI interrupter. 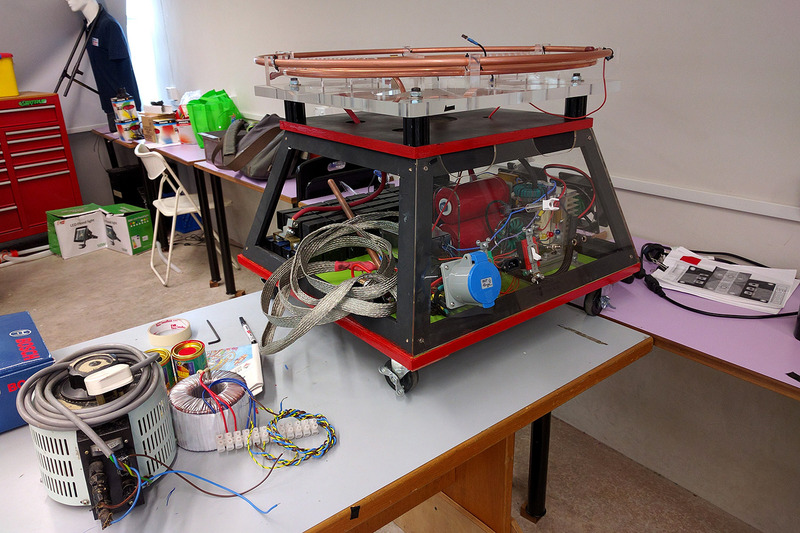 If you have read my DRSSTC 3 page, you might have seen that I also previously built a smaller coil which is currently residing in the Science Centre as well. This controller allows interface to these two coils via fiber optic for independent stand-alone operation. The controller can also be coupled with a computer, allowing both independent as well as paired polyphony music operation. 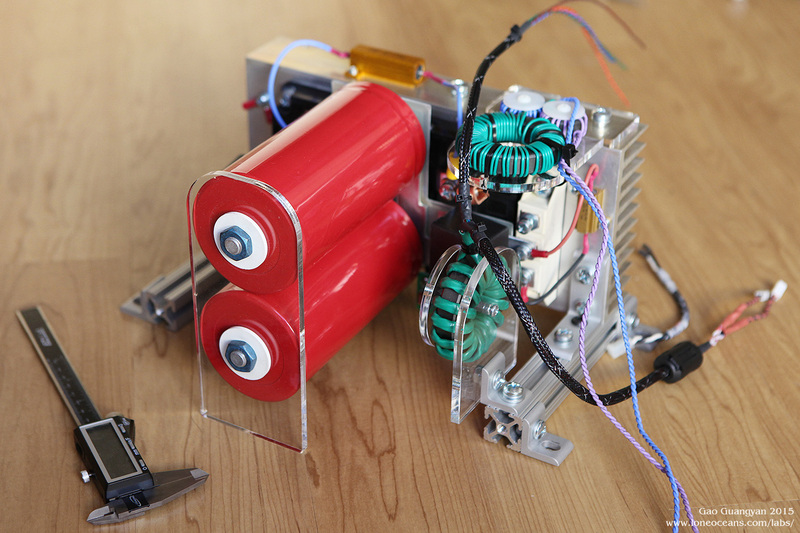 Despite running at just 60% of the designed operating primary current, the coil produced larger sparks than hoped! 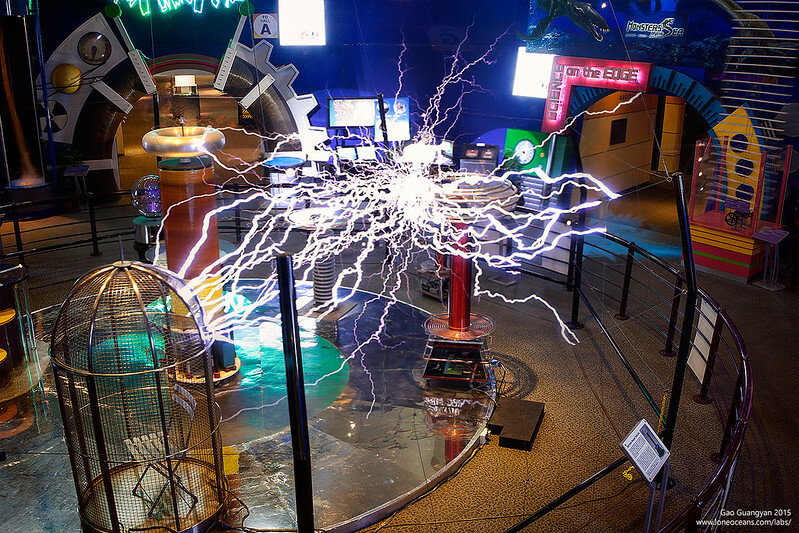 The power was turned down further for the interim since it was in the danger of striking all the other coils in the enclosure (which is fine, though), as well as the ceiling display! Above shows the first low-power MIDI preliminary test run of the coil in mid 2015, and gives you a good idea of the modulation capabilities of the Model 81 Tesla Coil. As of mid 2015, the Model 81 Coil is more-or-less complete, but there are plans for continualy updates of the coil with newer designs that I am continually iterating on. 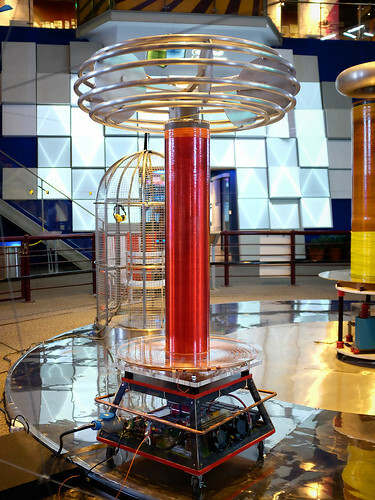 Today, the Model 81 Tesla Coil joins the existing spark-gap Tesla Coil in twice-daily demonstrations at the atrium of the Singapore Science Centre. 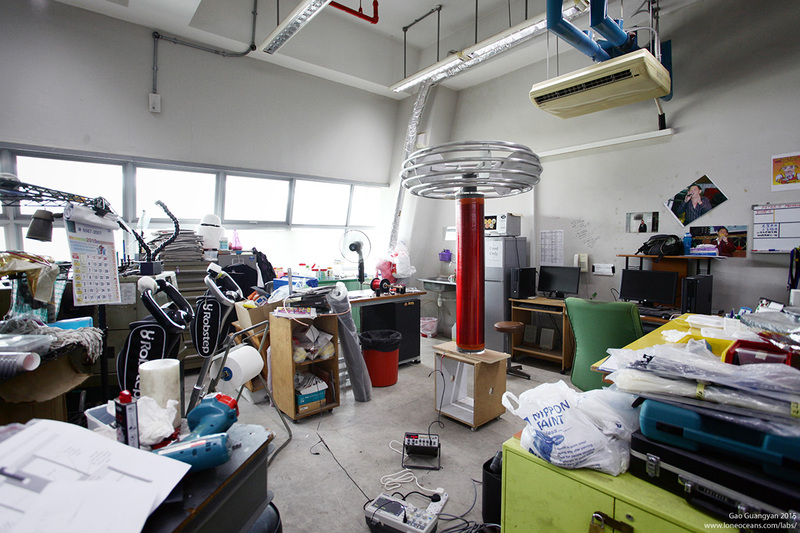 Feel free to visit the Singapore Science Centre to check out the Model 81 in action!